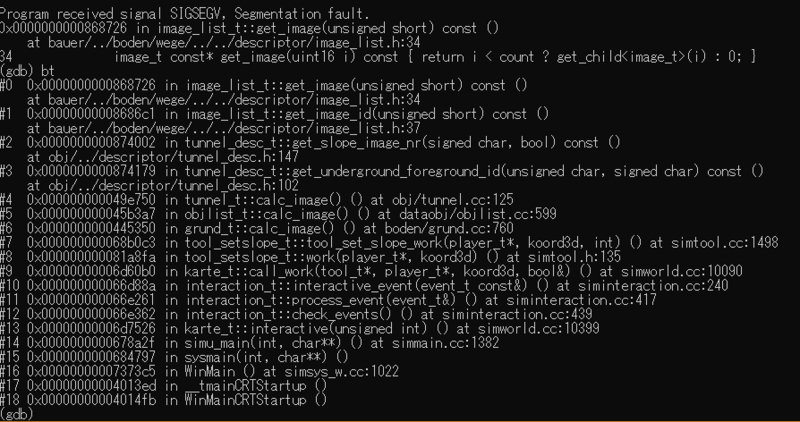 When using tunnel slope tool, immediately simutrans crashes. This error seems to be caused when calling calc_image(). Thank you for the report. The problem was that no slope graphics were defined. However, the game should not crash in this instance: I have fixed the tendency to crash (now, no tunnel specific image will be shown when there is no slope graphic), but I suggest that you might want to add slope graphics. Incidentally, these tunnel images are intended to be used for tunnel interiors, not track: the track image is the normal track image. Thank you so much, I confirmed that the problem is now fixed.